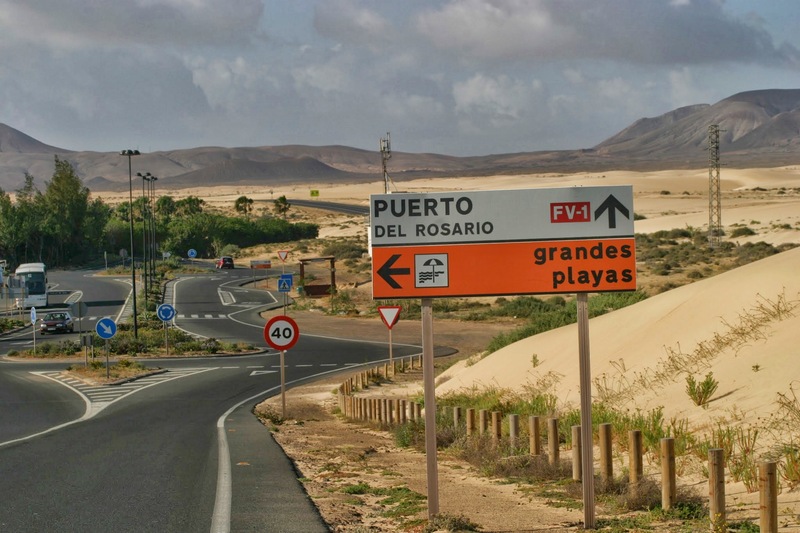 Fuerteventura is the Canary island of the archipelago with the mildest climate, to take a holiday at any time of year. In Fuerteventura you can enjoy unique experiences, such as whale watching, hiking and horseback riding. In 2009 UNESCO declared the island and its marine habitat a Biosphere Reserve. In Corralejo there are a water park and recreational parks for children. Extensive bike paths and pedestrian areas allow you to have relaxing walks or ride a bike, ideal for families. The perfect place for those who practice water sports, Fuerteventura is the ideal destination and Corralejo is a strategic gateway to the best beaches where to practice Surf, Windsurf, Kitesurf, Sup (Stand-up paddle). There are many surf schools where you can rent equipment. From the port of Corralejo you can take the ferry to Lanzarote (20 min.) or hike the picturesque Isle of Lobos. Wonderful beaches and crystal clear sea are waiting, come enjoying your holiday in the Canary islands, the archipelago with the "the best climate in the world"
Once in Corralejo what are the main emotions not to be missed? - A barefoot walk on the dunes. In the early morning or late afternoon before it gets evening, so as to enjoy a beautiful light and not have too strong wind. The place is easy to reach on foot, by bike, by car, taxi or bus. On the road from Corralejo to Puerto del Rosario, after the big RIU Hotel, start to walk towards the interior of the desert and leave youself losing in the dunes. Soon the noise of the road behind you disappears, great silence and only soft cool sand under your feet. One of the gifts of nearby Africa (only 100km), the Sahara sand brought by the warm wind drew fantastic dunes. - El Cotillo. 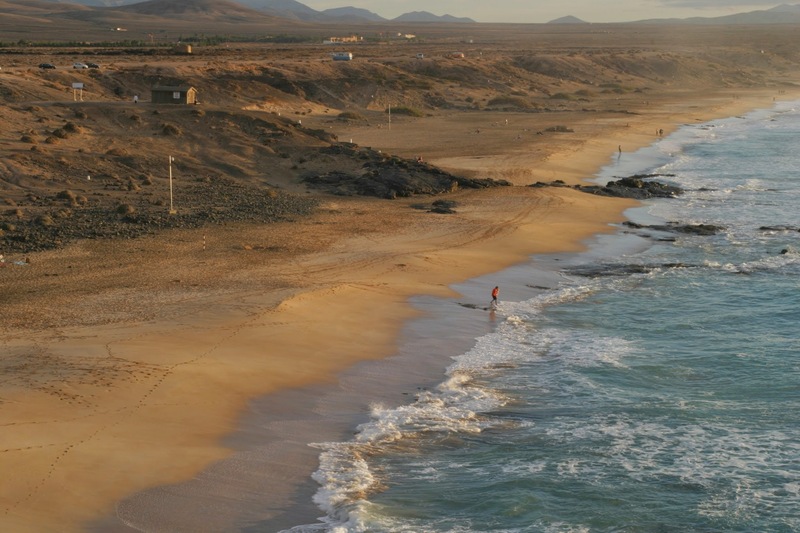 The small village of Cotillo offers fantastic sceneries. About 30 minutes drive from Corralejo, in the opposite coast. It comes from passing Lajares and going for the charming, bare hinterland. After the first houses of El Cotillo I suggest to turn left for the "Toston" Tower, but this is not the true wonder. Shortly after the view of the ocean opens, cliffs, a huge beach populated by long-wave surfers chasing. While to the right of the country, there is the possibility to enjoy the white beaches, the "Lagos" and "La Concha". With the low tide they create real natural pools of crystalline water where finally the Atlantic Ocean becomes accessible temperature. - Lobos Island. The Lobos islet stands as protection of Corralejo bay, it's 2 km far from it and is easily accessible, located just 15 minutes, with the various boats that depart from the port. Protected national park and unspoiled, offers some wonderful coves with crystal clear waters, secluded and remot beaches. A place out of the world to live the ocean to discover the wonderful underwater diving. Surf lovers know well this island for the mythical "big wavet" among the longest in Europe (about 1 km) with a height of up to four meters. - Grandes Playas. Where the desert ends, before the sea, there are the "Grandes Playas". Kilometers of white and warm. Easy to reach, either by car, bike or on foot. There are areas equipped with sunbeds and umbrellas, other large completely free areas. It's easy to meet the characteristic "nests" of volcanic stone to shelter from the wind and sunbathing. 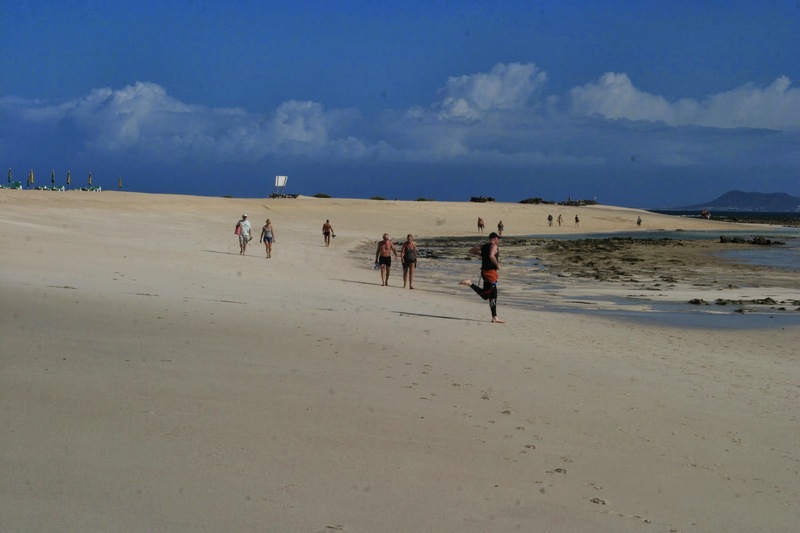 Located along the main beach, immersed in the dunes, you will find small bars where you can have lunch. The sky is filled with the colors of kite sails, always refer to this to reach the Grandes Playas. In addition to these 4 simple but fantastic emotions for everyone, Fuerteventura and Corralejo can offer much more. Boat trips to meet dolphins ((ICENAI Tel. +34 616705188) or catamaran, horse riding (Anibal Tel.+34 669017188), hiking on volcanoes, Surfski tours with Maeva Kayak. In Corralejo there's also a beautiful Golf course, several tennis and paddle courts. The fun for younger is secured by the water park. 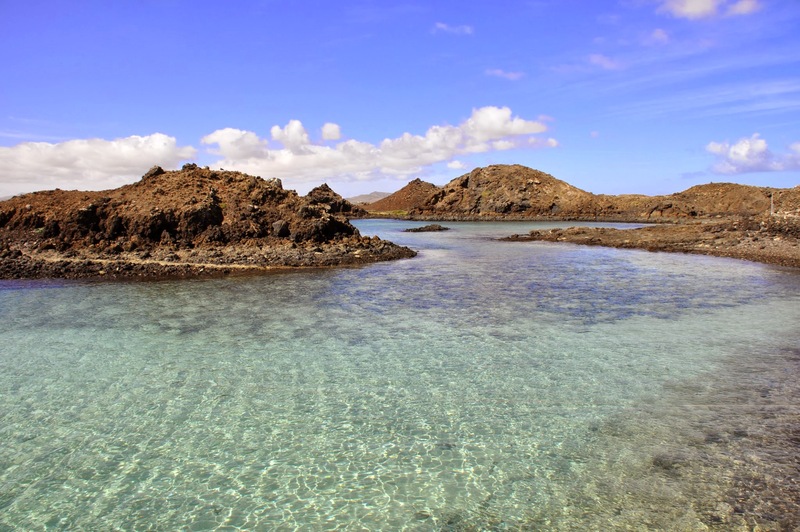 The south of Fuerteventura can be a destination for excursions and visits, passing by Caleta de Fuste that in addition to the beach also offers the only thalassotherapy center of the island, a well equipped SPA for an afternoon of relax. Further south you arrive in the area of ​​Costa Calma and the particular Sotavento beach, stage of the world windsurfing championship. For adventurers there is to also the legendary Cofete beach, that is located further south. To reach it you need a 4x4 to travel the approximately 20km of dirt road. This beach was the location of the Exodus of Ridley Scott. It's amazing and fascinating, but difficult to achieve. Coming back north on the west coast, you can go to Ajuy, a small village on the sea with the most beautiful black beach of the island. On the right side of the beach, starts a cliff path that leads to giant caves with very particular views of the ocean. In the return trip to Corralejo, through the hinterland you can climb up to Mirador Morro Velosa (Betancuria) where to enjoy a breathtaking view. Do not forget also that Lanzarote is only 30 minutes by ferry from Corralejo and it is therefore recommended to dedicate a day also to visiting this island of the Canaries. Lots of sun with his energy and his vitamins, but also the tranquility of the sand, the sea adrenaline and magnetism of volcanoes. These are some of the reasons to come and discover this Atlantic island.